It is common for people to use the terms roundabout and traffic circle interchangeably, as though there is no difference between the two. Sadly, Streetsblog San Francisco, whose mission is to educate the public, claims that there is no significant difference and that it is OK to use the terms interchangeably (SFMTA Launches “Muni Backwards” Program). That is not true. Traffic circles do not usually have these features. The photo at right shows a roundabout in the River District/Township 9 in Sacramento. It is quite a bit bigger than a roundabout needs to be, and was installed in a new development, not at an existing intersection, but you can see the deflection and yield signs. Significant horizontal deflection means that vehicles must change significantly from a straight line of travel, which requires that they slow significantly. This slowing reduces the number of crashes somewhat, and almost eliminates the number of severe crashes and fatalities (about 80% reduction). They are safer because they greatly reduce the number of conflict points in an intersection. Yield signs on all approaches means that vehicles only have to stop for other vehicles already in the roundabout. Otherwise, they proceed at their reduced speed and never have to stop. This yield approach benefits motor vehicles and bicyclists who ride in the travel lane. It does not, and is not really intended to, benefit bicyclists in bike lanes or pedestrians, but at the same time, if does not hurt them. There is one standard MUTCD sign used at roundabouts, shown at right, but you will also see many other signs at both roundabouts and traffic circles. Traffic circles vary widely in size, and therefore the amount of deflection. 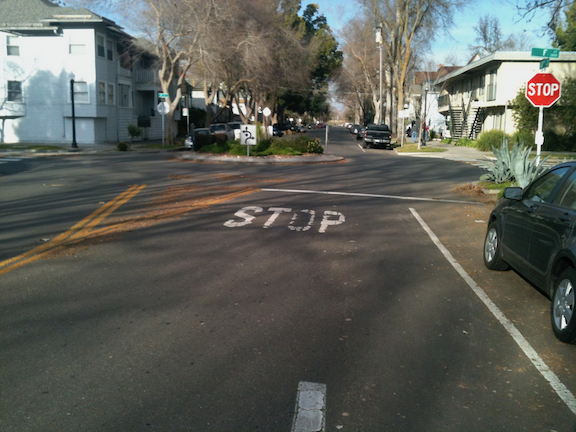 At least in California, they almost always have stop signs on two of the approaches, so that one street does not stop and the other does. The photo at right shows a traffic circle in downtown Sacramento. It has some deflection, but not enough to really slow traffic, and with the stop sign, does not ease the flow of traffic. These traffic circles also squeeze bicyclists who do not know they need to take the lane to safety navigate the intersection. The traffic circle sign is not a federal or state standard sign, but does communicate. There are a a number of traffic circles in Sacramento central city, most of which were put in years ago, but a few newer ones also exist. Depending on the size of the circle, they have varying traffic calming benefits. The reason traffic circles are used instead of roundabouts is that you can’t just plop a roundabout into the footprint of an existing urban intersection. They require more space. There are a lot more features of roundabouts than just the two that I mentioned. If you want to become a traffic nerd on roundabouts, I recommend the FHWA roundabout page, particularly the publication Roundabouts: An Informational Guide, Second Edition. For an international best practices perspective that focuses on bicyclist benefits, check Explaining the Dutch roundabout abroad. Multi-lane roundabouts probably do not have significant safety outcomes over regular intersections. Many Sacramento people have experienced multi-lane roundabouts in Roseville and in Truckee at the Interstate 80 – Hwy 89 interchange. It makes me nervous to even watch these, and I always label these as multi-lane roundabouts to distinguish them from single-lane roundabouts or just roundabouts, which do have very significant safety outcomes. Lastly, the type of traffic circle that engendered the discussion in San Francisco is at right. It has several non-standard features, even given the variability of traffic circles. Several [whatever these are] can be seen on C and D streets around 20th. They seem like a good idea. I have been puzzled by the speed limit, “17 mph”, which seems oddly precise. I wonder where they got it. There are a number of traffic circles in Sacramento central city. None are roundabouts – they all have stop signs on one street. I don’t know about the speed signs, I guess I had never noticed them. The city’s traffic engineer at the time of the circle’s construction thought the unusual speed limit would get more attention and thus, maybe, more compliance. Didn’t work for Dan, apparently. Do you know approximately when the circles were installed? Was it at the same time as the diverters? Frankly, I think roundabouts and traffic circles are designed to make the driver a bit nervous, or, at least more aware, of potential collisions with others, and to get drivers to slow down. I wish roundabouts were used much more frequently in urban areas of Sacramento. My first regular encounter with roundabouts was in the city of Puebla, Mexico, where I lived and drove for nearly a year. Several had multiple lanes, and everyone learns to slow down (but not stop! ), and smoothly blend in. They worked great. I spoke with many residents and taxi drivers there, and they all remarked that, though fender-benders were not infrequent, fatalities were practically no-existent. The same could not be said for intersections with stoplights…. Davis has two multilane roundabouts near each other just west of Hwy 113, and they are easy for cyclists to use, either as signed on to the sidewalks, or by taking the outer lane.